Last time I mentioned mid-century fireplaces a reader commented that she was lucky enough to find a Condon-King Aztec free-standing fireplace. Having never seen a Condon-King Aztec, I went in search of an image and my old friend Google books came to the rescue, and pointed me to an amazing Popular Science article from 1967, "New Products for Improving Your Home." Free-standing fireplace is made of new space-age ceramic that let you safely put it within five inches of any wall. Call the Aztec, the fireplace comes in five colors: Inca gold, bronze green, Mandarin red, burnt orange, and desert sand. The screen, flue sections, and spun-steel base are matte black. It has a seven-inch flue that connects easily to any chimney approved for solid fuel. Made by Condon-King Co., 5611 208 Ave. S.W. Lynnwood, Wash. 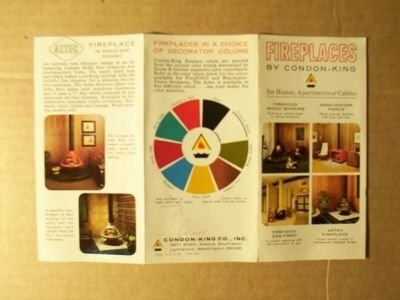 Interesting...I wasn't familiar with the Condon-King ceramic fireplaces till I read that comment recently. I'm glad you found this information. Hey, I recognized that brochure - found the same image when I was doing my research! Here's a pic of mine - needs a little bit of cleaning up, but it's going to be a great feature in the backyard! Casey, would you mind if I posted your photo (with proper attribution of course)? I haven't been able to find a real life photo of an Aztec fireplace and would love to share it. hope this gets to you. Only 7 yrs later. I have one of these. In orange. Sure! Here's another one - you can see the base a little better. This is an old post I know but I have an Aztec in my house. I would love to find one of those brochures somewhere. As someone who's been looking for a Broyhill Sculptra brochure for years, let me be the first to tell you that finding a paper product that 50+ years old is hard. But worth it if you ever find what you're looking for. With some more research I actually found out my vintage Aztec model is from Majestic of Huntington,Indiana. The color has "black flecks" in the finish and the screen handles are slightly different than the Condon-King - elongated rather than the knob type. Otherwise same shape. They look just as amazing as Aztec fireplaces. Mine is not like the one pictured. It is an Aztec style like the Condon-King shown above. But the Majestics had the long screen handles and the black flecks in the finish. Mine is pictured in the link below. Although you can't see the flecked finish clearly, you can see the different screen handles. The latch above the screen is non-original, I added that as a way to keep the screen more secure as it was only attached at the bottom before. That is a good looking fireplace. Consider me super jealous. Does anyone know how much a Condon-King in bright orangeish red is worth today? It still looks brand new not a scratch on it. I have a red-orange one.